If you don't have a home networking backup strategy, you should. It is likely if you don't, you either don't know how to get this working, or you have never been burnt by not backing up. The following is what I do. Local copies - I keep all content local on my machines. 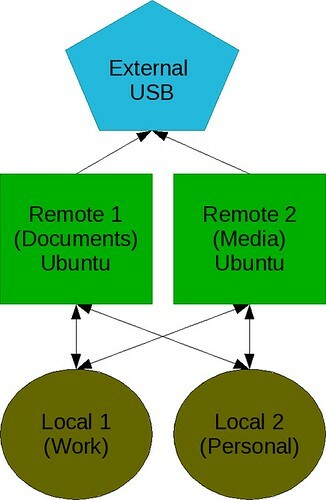 Remote copies - All the local content is actively synchronized to "remote" machines. Off line copies - All content is copied to an external hard drive that is solely used for mass storage. In total, I have four active computers in my home that participate. Two computer are laptops for everyday use, one for work, one for personal use. The other two are towers. Both towers are used for the "remote" backups. One of these machines is used for storing documents and the other is used for storing media (the storage needs between the two should be obvious). Each laptop primarily uses Microsoft Windows XP, I say primarily because they both dual boot with Fedora Linux and XP. Each tower is running Ubuntu Linux server edition. Each tower shares appropriately with Windows through Samba shares. Each laptop has their appropriate remote directories mounted at login, and each remote folder is marked to keep remote content available offline. And so, each laptop is synchronizing with the remote machines to copy the appropriate content.